My Ten Friends Carbon Based Life, You can probably guess by the previous posts of MTF Pew!Pew!Pew! 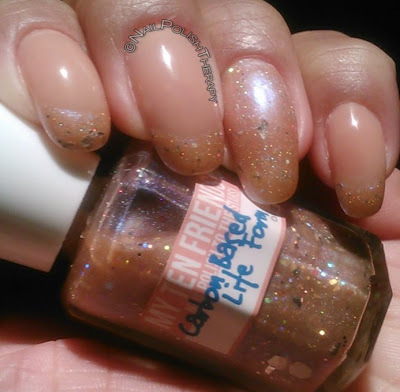 and MTF Dirtball that I really like this Indie polish line. The owner, creator and distributor Mei-Lynn is so creative and great to do business with I have decided to continue purchasing from her. Recently I placed a pretty large order and I can't wait to get them so I can share them with you. In the meantime here is Carbon Based Life paired with Sation Capuccino on the base of some of my nails. 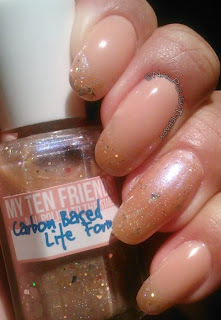 MTF Carbon Based Life is a peach iridescent based polish with gold XL hexes and smaller holo micro glitter. 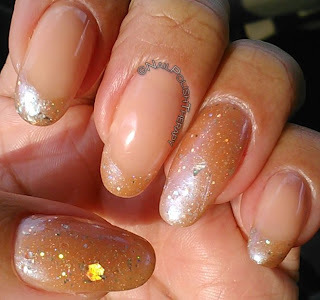 The formula was a breeze to apply and removed alot faster than other heavy glitters. My favorite part of this polish is the XL gold hexes. Another beauty from MTF. You can purchase Carbon Based Life at her Etsy shop and they are $8.88 per bottle.